AFC Fylde manager Dave Challinor admits winning is the only option as his promotion-chasing side head into the final 10 games of the season. Fylde welcome fourth-placed Aldershot to Mill Farm this Saturday but Challinor insists all 10 remaining fixtures are of equal importance. 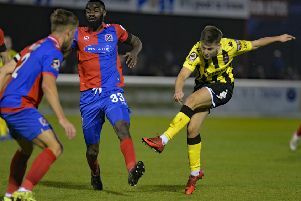 Asked if the clash with the Shots is a ‘must win’, Challinor said: “If I was to look at it like that, then every game until the end of the season is must win or must not lose. “We are going to have to win far more games than we lose if we are to secure our place in the play-offs. “This is one of 10 games remaining and we are potentially going to have to win seven. “It is about winning games at this point. Draws are okay between winning runs but at this stage one point from a game isn’t really enough. “I don’t really see Aldershot as a direct rival to us. The way the table stands – although it can change very quickly – I think it’s between ourselves, Dover, Bromley and Ebbsfleet for that final play-off spot. “We could still close the gap on the clubs above but I think the teams in the other five play-off places are looking safe up there for now. “I don’t feel like it’s about taking points off Aldershot – it’s purely about picking up points, regardless of who we are playing. “We will set up to win. I think we have only set up to contain a team once this season and that was in the cup against Wigan. Aside from that, we have gone out to win every game. Fylde must top a ‘mini league’ of promotion hopefuls but Challinor isn’t interested in results elsewhere. He added: “We can’t worry about what other teams do because there are too many teams still competing. If we were to rely on other clubs dropping points every week, it just wouldn’t happen. “If Dover were to win every game, there would be nothing we could do about it but I don’t expect that. “I think we would be very unlucky to miss out if we win seven. “Teams around us play each other too, so if someone offered me seven wins now I would absolutely take it. n Goalkeeper Theo Roberts has joined Fylde on a work experience loan deal from Wigan Athletic. The 19-year-old, who has impressed in the Latics’ Academy side, will provide back-up for Coasters number one Jay Lynch, with Rhys Taylor on loan at Tranmere Rovers.